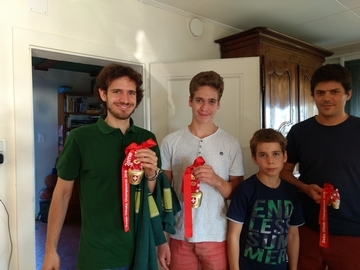 Switzerland championship was from the start a fight between Arthur Juigner and Michele Borassi who should be the Swiss Champion. It was four players in the championship, so they played a double round robin. Michele won the first game against against Arthur with 42-22. I the last pre-round Arthur got his revansh with 45-19. In the final game Arthur took a steady grip on the match right from the start and made comfortable with 45-19.